Being Responsible Human: Every human live with minimum needs and allow other beings to live. 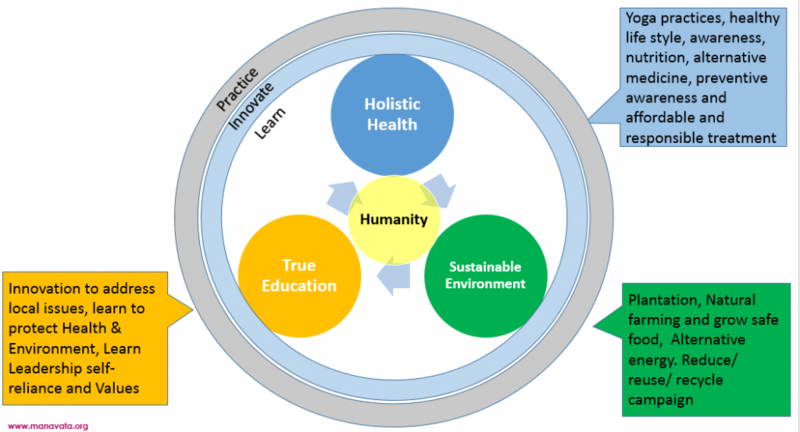 Manavata believes that achieving self-sustainable model of living is the key to build 3H world! So Manavata has been working in 15 different villages so far with it’s proven projects of health, education and environment. These projects are helping those villages in many ways and helping the sustainability. Now Manavata would like to extend those projects to many more villages (500 villages and make them self-sustainable by 2030), which needs massive scale of improvement in human capacity. 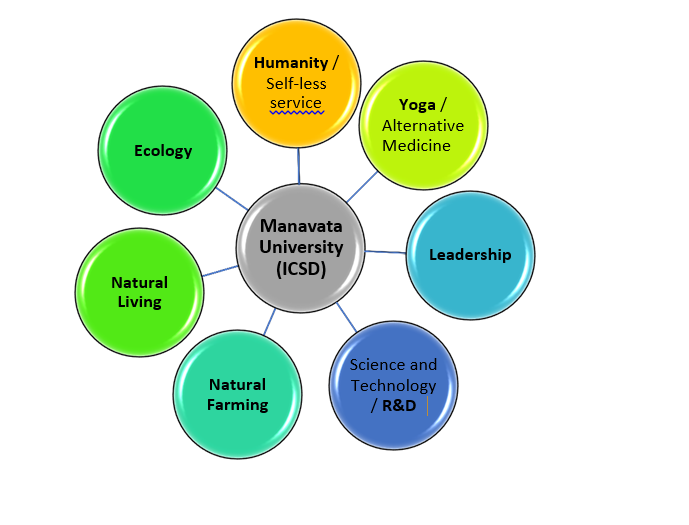 So we are planning to establish a University of Humanity (Manavata University) and International Centre for Sustainable Development (ICSD). This is basically to build practical and efficient leadership for sustainable rural development and humanity. This is a practical and informal education to learn through practice and to bring local innovation for eco-friendly technology. Core theme remains to build human excellence through Yoga, Human values and self-less service. Campus contains institutions for Yoga, Health, Leadership development, alternative medicine, Environment/ecology and natural farming. It is unique world class institution with international standards and innovative methods especially for the practice of humanity and Nishkama Karma (self-less service)! Multiple catalyst projects will be demonstrated with ICSD campus. Allows people to learn, practice and allow them to bring innovative ideas. Short term courses are designed such a way that informal practical learning in real time is possible for doctors, teachers, farmers and youth. All we need is sustainable health, environment, true happiness and harmony. So we need education system, which can help everyone to learn these sustainable practices and humanity. 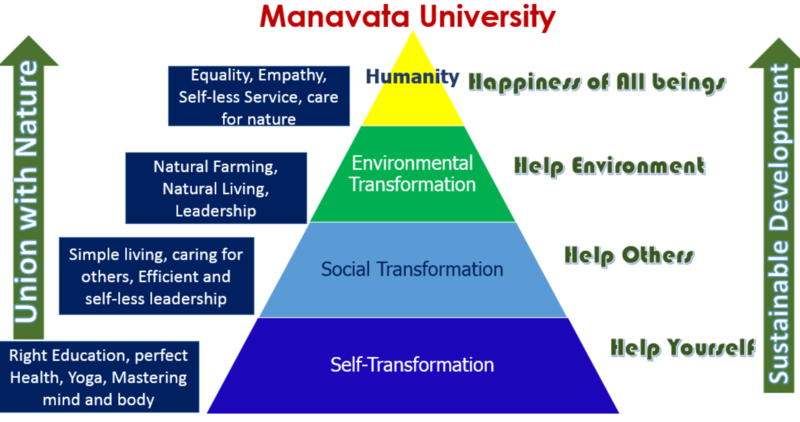 Hence Manavata University is the answer. While we are making rapid technological advancement, issues like climate change, health risks and poverty hitting their peaks. Looking at root causes, around 70% of world’s pollution is from agriculture and over 70% of poverty is in rural areas, both are major issues are related to rural areas and both issues are already brought critical health issues and damaging soil and environment. This also leading to number of other issues, hence this needs immediate action from all countries. Following are the key areas of practice and departments of Manavata University. Proven faculty, who are practitioners in their own field will be mentoring these courses. Each area will have a practice within campus and with other collaborations in respective areas.